"Cannibal Holocaust" is an animated tapestry by spiritual Vermont artist Alicia Minor with music by Mister Rourke. 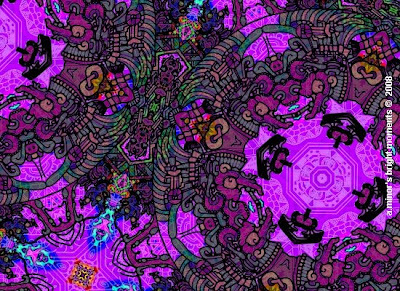 Alicia's artworks, animations and fabric designs are a splendiferous salmagundi of Mayan mandalas mushrooming into a psychedelic afterbirth. Watch full screen for complete cartwheeling ecstasy. Earth to Sun Ra: Please return to this astral plane ASAP. 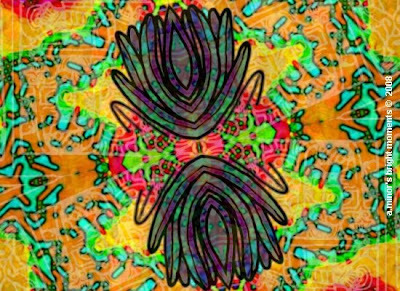 Alicia Minor, aka A.Minor, is a seventh generation Vermonter and artist who specializes in psychedelic poster art, reviving the revolutionary artistic attitudes of the 1960s with a tech touch both modern and mystical. Since the early 1980s, she has created vibrantly colored wall hangings, art quilts and scarves from her own hand-dyed fabrics. 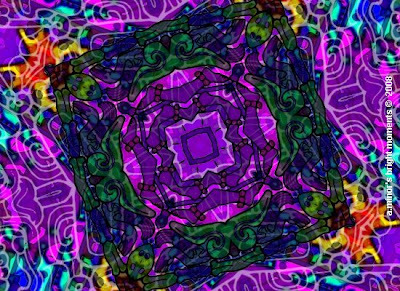 In the late 1990s, she began working with digital imagery, incorporating ancient Mayan designs, sacred geometry and fractal theory, then applying her experienced quilting eye to deconstruct and reconstruct her work into kaleidoscopic, prismatic patterns for the 21st Century. Minor is currently at work on new animations and a graphic novel based on the autobiography of her great-great-great aunt, Marie Louise Menard Clemens, who was born in 1863 in St. Albans, Vermont.